Laminated pine consists of lengths of timber bonded together with strong adhesives. 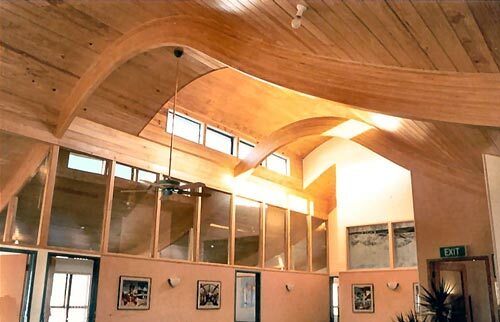 The laminates can be glued together to form beams and curved shapes, and are used extensively for structural work. This example is the office and factory of McIntosh Timber Laminates Ltd in East Tāmaki, Auckland. It features five laminated radiata pine beams that span 14 metres. The ceiling is tongue and groove radiata pine.